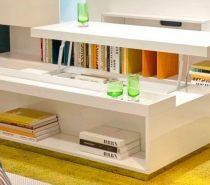 The perfect accessory to pull together any Mid-Century Modern living room, bedroom, office, dining room, or den. With their unmatched style and timeless designs, Mid-Century Modern clocks are a timepiece that you and your decor don’t want to miss. 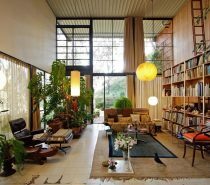 In the words of the iconic designer Charles Eames, “The details are not the details. 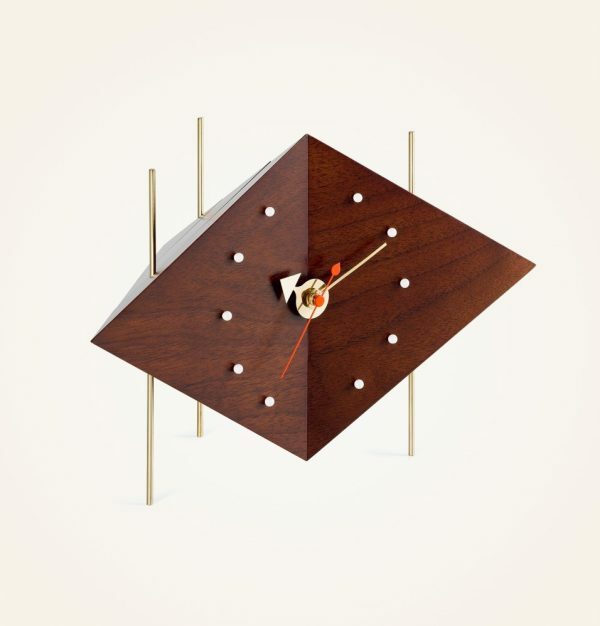 They make the design.” So, whether you’re looking for a Mid-Century Modern Bluetooth clock speaker or a classic George Nelson Ball Clock, we’ve scooped out the best Mid-Century Modern clock designs available online. What time is it? It’s time for you to choose your favorite! 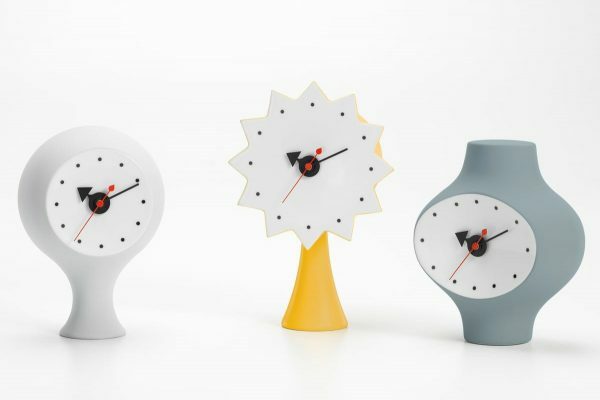 Vitra Ceramic Clocks By George Nelson: The burst of color paired with bold shapes tells us that these must be from the collection of Vitra Ceramic Clocks By George Nelson. 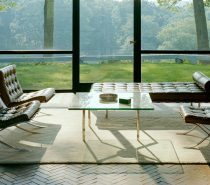 A fun and edgy line that are considered to be icons of modern American design. Available in multiple colors and shapes. 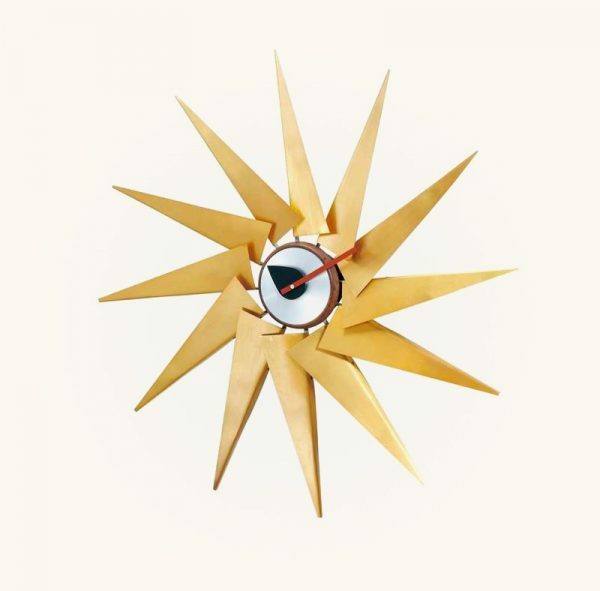 Vitra Sunburst Clock: This sunburst wall clock is like an explosion of sunshine for your wall with its colorful design and sunny shape. A great timepiece for either the home or office with its sleek, numberless design that will surely get noticed. 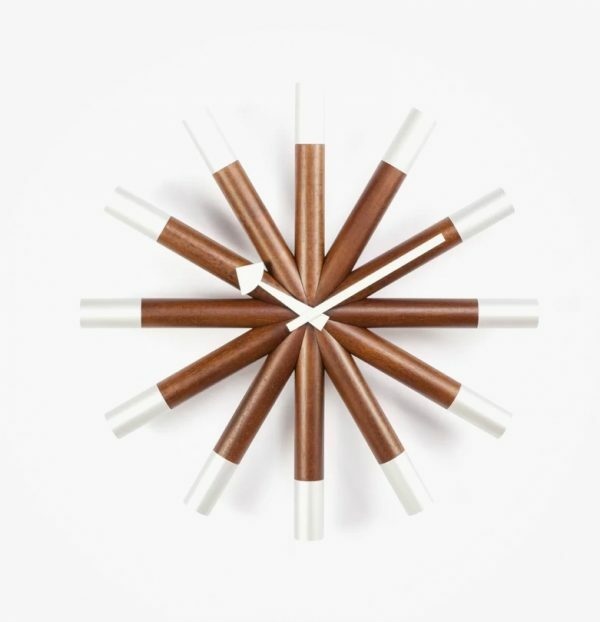 George Nelson Ball Clock: Another bright and bold clock from an iconic industrial designer of American Modernism, George Nelson. If this clock is yes on your wishlist, but a no according to your budget, you can also get a cheaper replica here. 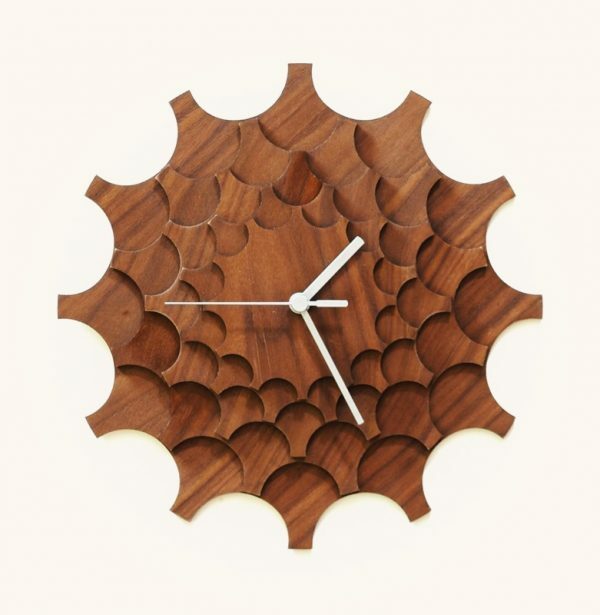 Petal Wall Clock: A flower in its basic form has never looked so chic! 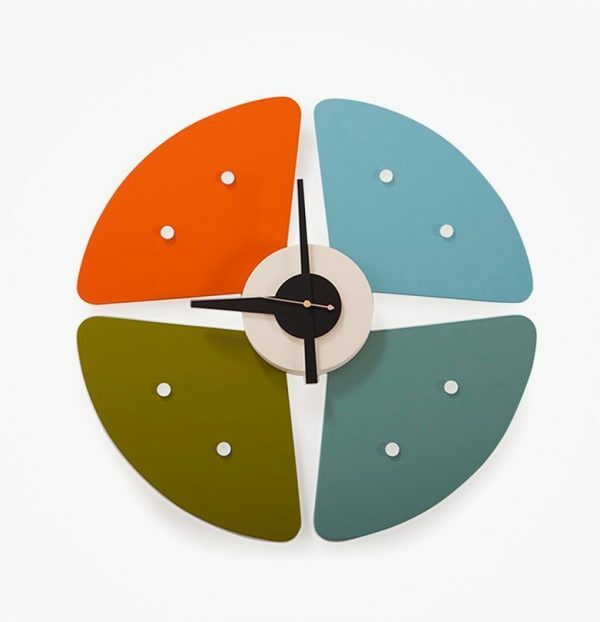 This petal wall clock is the perfect wall piece to add just the right amount of color to any Mid-Century Modern space. 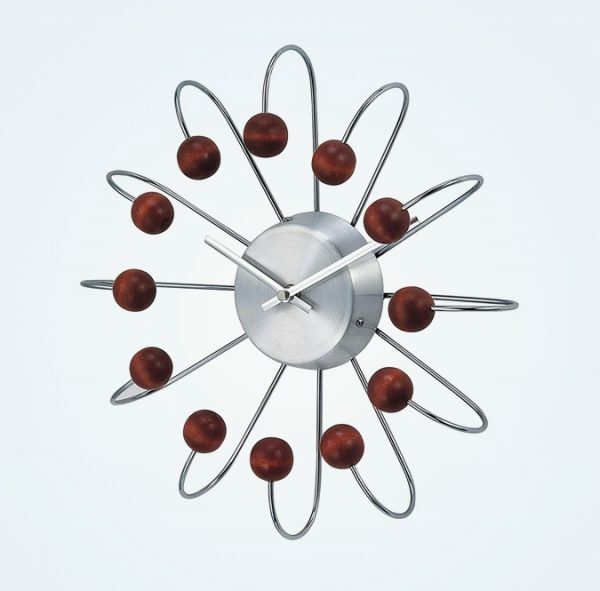 Mid Century Style Wood And Metal Clock: The combo of wood and metal come together once again to create a striking design piece that resembles miniature wood planets orbiting the sun. A unique wall clock that is perfect for any space lover—both young and old. 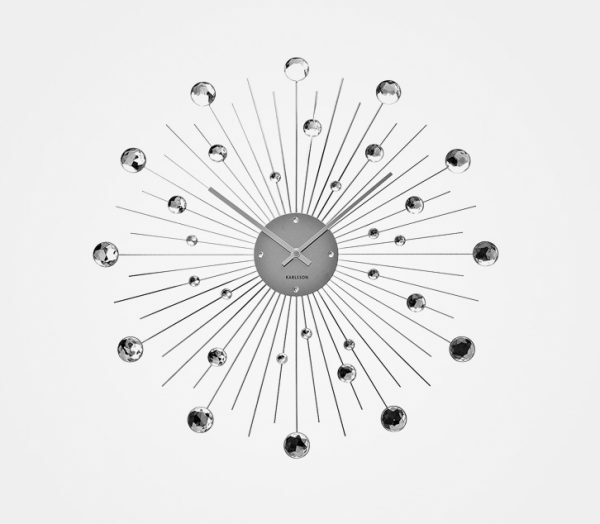 Arne Jacobsen Bankers Wall Clock: Originally designed for the National Bank of Denmark in 1971, Arne Jackobson unknowingly also created a design icon. This unusual clock with its one-of-a-kind number system is still true to that original design and available in 4 sizes. Mid-Century Modern Style Desk Clock: The perfect pop of Mid Century Modern style for your desk or shelf. 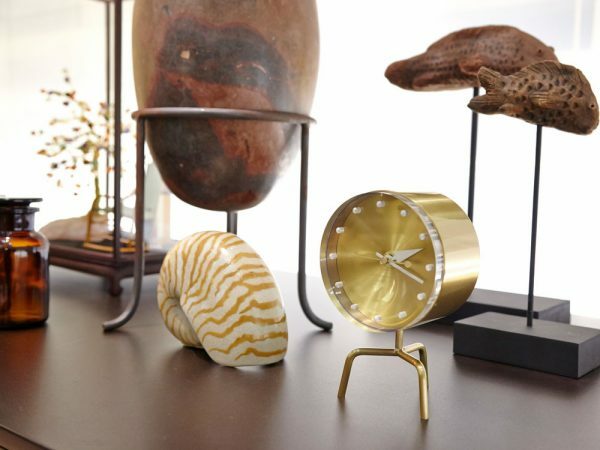 This gold desk clock pulls double duty by both keeping time and making sure your decor is on pointe. 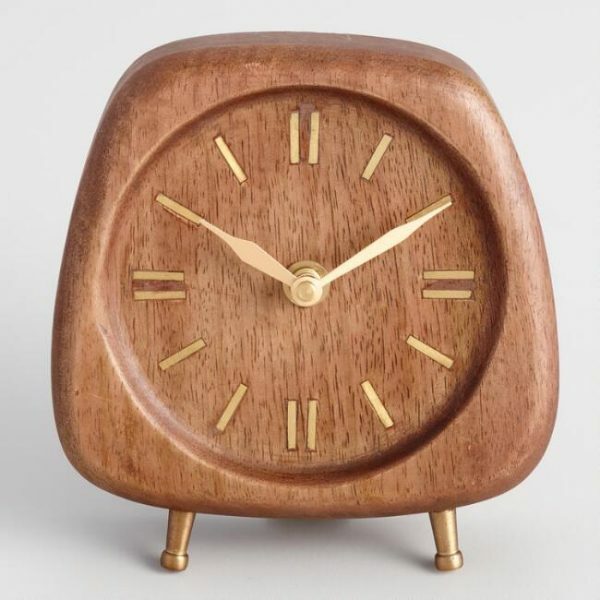 Wooden Mid Century Modern Desk Clock: This clock might make you do a double take with its sleek wooden face, unique shape, and tripod legs. A piece for those who truly like their decor to be both whimsical and iconic. 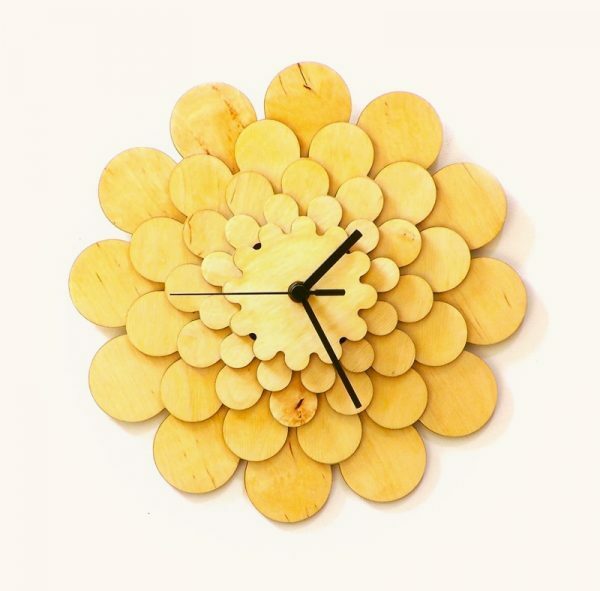 Dahlia Wooden Wall Clock: A Dahlia bloom that will stay fresh all year long with its multi layer, wood design. 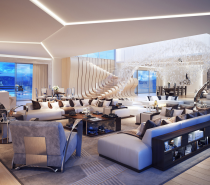 A magnificent handmade piece by the ultra-talented Hungarian architect, Ercsényi Miklós. Cogwheel Patterned Mid Century Modern Walnut Wall Clock: Another layered clock design, but this time with a cogwheel pattern. Hand created with birch plywood that showcases the natural grain and intricacies of the wood. Also available in a lighter tone. 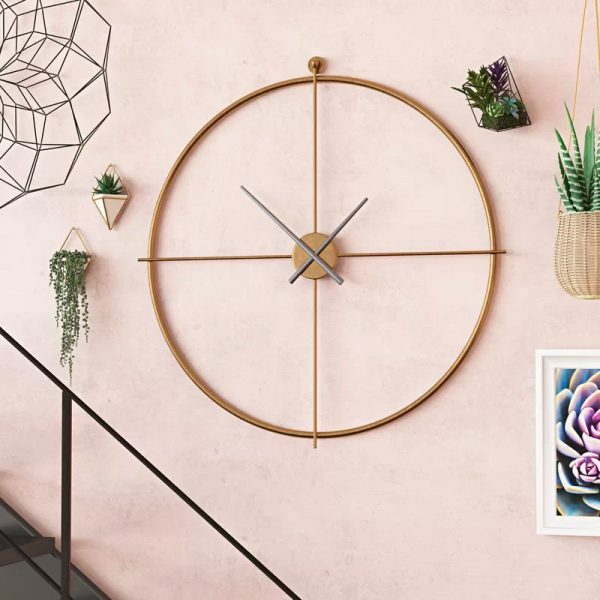 Mid Century Modern Style Wall Clock: This type of wheel may be useless on your car, but its worth a thousand words on your wall. The Nelson Wheel Clock is a classic Mid-Century Modern timepiece full of simplistic style. Love the design, but not the price? A cheaper replica is available here. 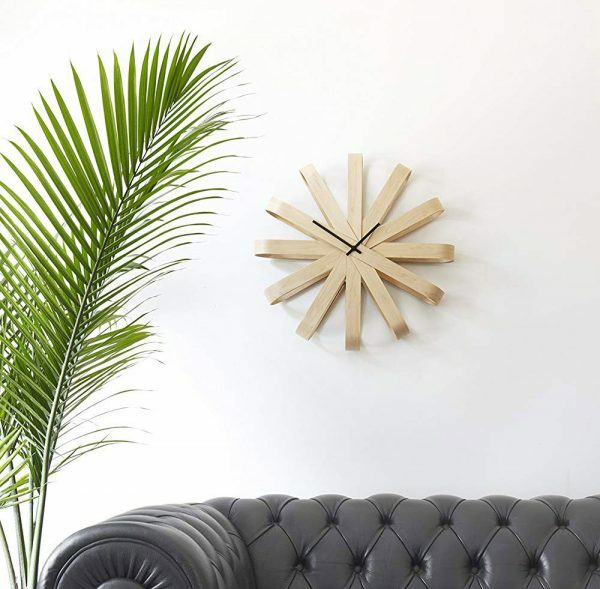 Dark Wood Spindle Wall Clock: A stylish clock that is sure to compliment your Mid-Century Modern decor. The dark wood spindles and geometric hands create the ideal mix of whimsy for almost any space. Photographed is a replica of the Nelson Spindle Clock, but you can also get an original here. Folded Wood Ribbon Style Clock: With its organic aesthetic, this wood ribbon style wall clock is a versatile Mid-Century Modern accessory. Created from beechwood that’s gently bent into folded ribbon shapes to represent the hours, this affordable clock also boasts a 5-year manufacturer’s warranty. 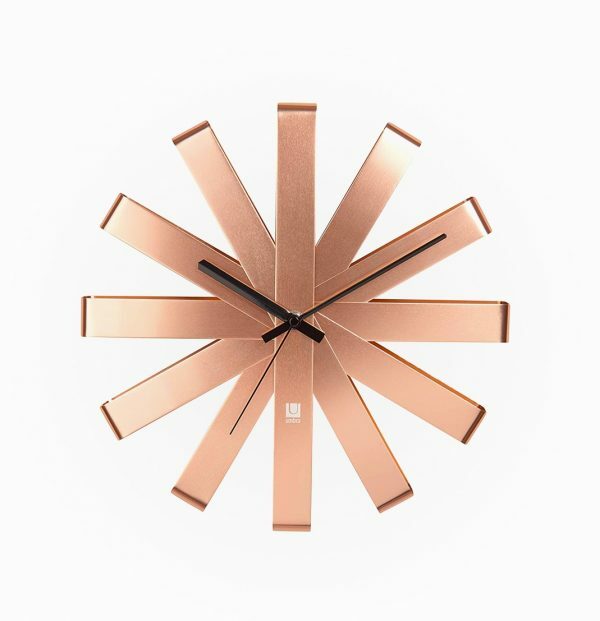 Copper Wall Clock: Another ribbon style wall clock, but this time with a sleek copper finish. 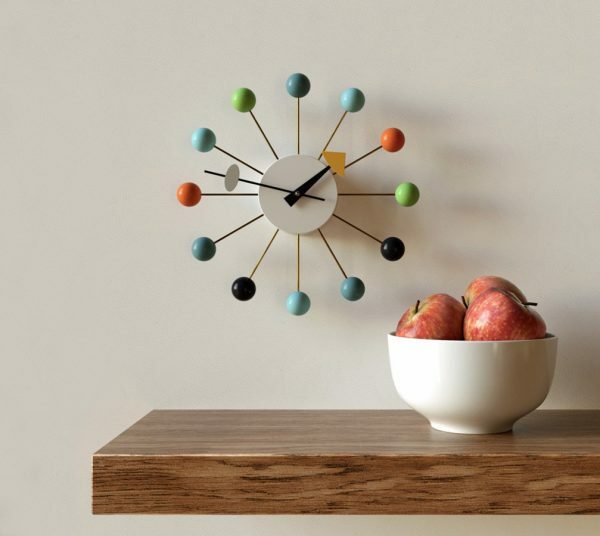 A Mid-Century Modern inspired clock that is sure to keep both your decor and budget in check. 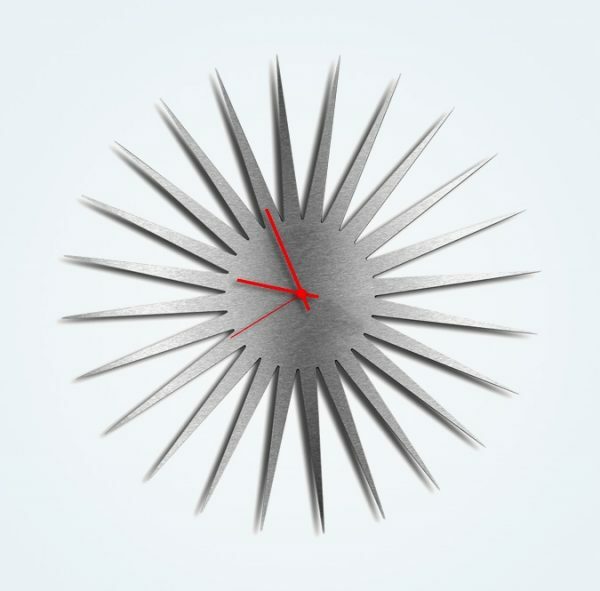 Silver Brushed Metal Finish Starburst Clock: An edgy clock that will look sleek with its metal design and contrasting red hands in any industrial space from the home to the garage. Plus, if you hear an intruder in the house, you have a secret, giant ninja star hanging around—literally. George Nelson Turbine Clock: A clock that gives the illusion of a gentle movement with its bladed, turbine design. This timeless timepiece is based off the original George Nelson Turbine clock and can be yours for a fraction of an “official reproductions” cost. 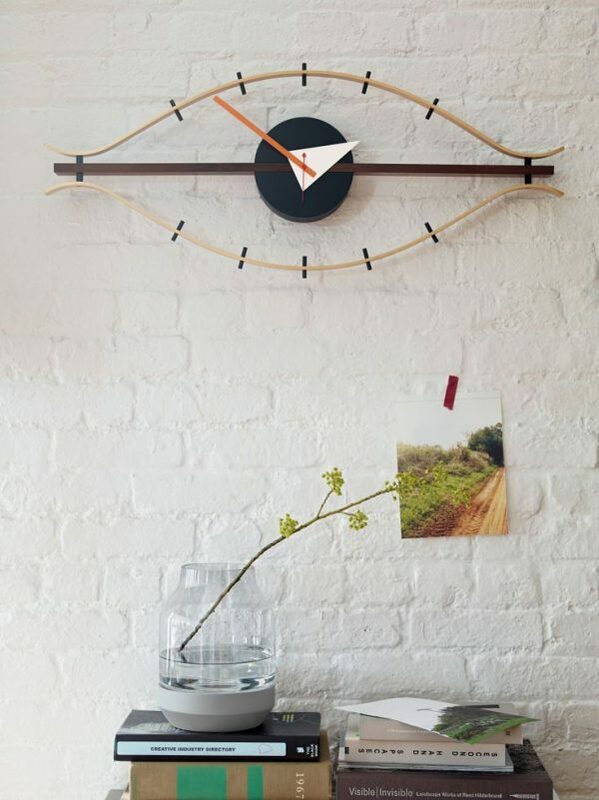 Mid Century Modern Wall Clock With Spokes: This is one clock on the list that really spoke to us! 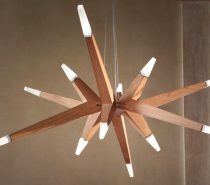 With its wooden design and starburst spokes, this piece is an ideal example of simplistic flair. Grey And Wood Sunburst Style Wall Clock: This multilayered clock featuring a grey and wood sunburst will add a splash of energy to any wall. Available in 2 base colors and 10 hand colors. 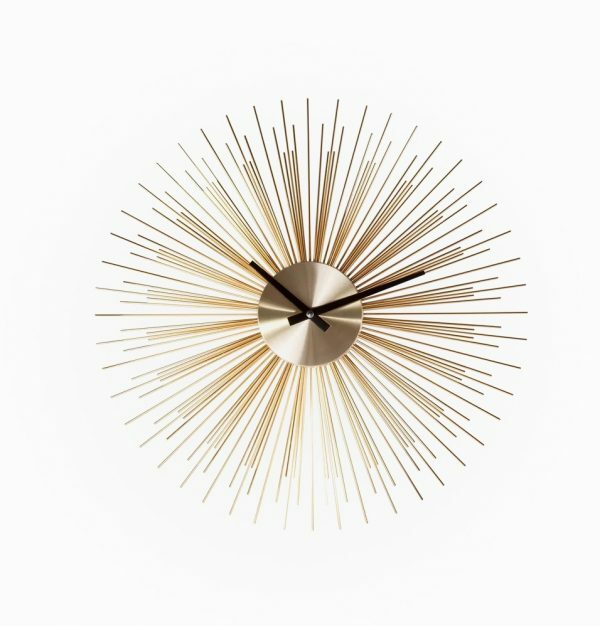 Metal Sunburst Style Mid Century Modern Wall Clock: A little glitz and glamour in the form of a golden sunburst style clock. Equipped with a high-quality Quartz movement and also available in Black. 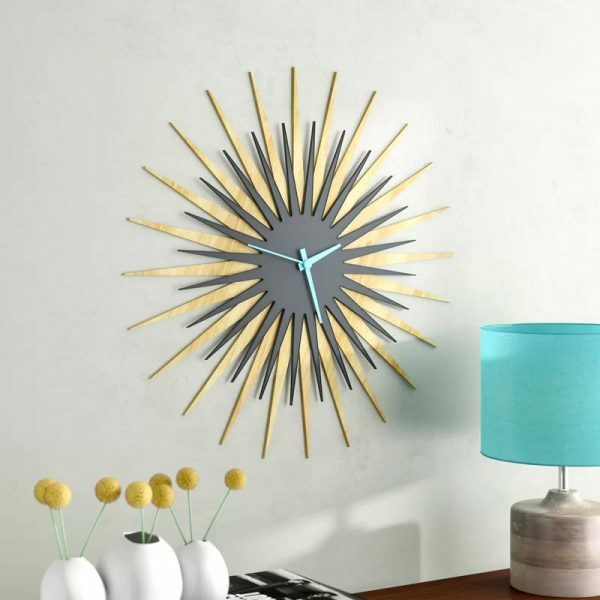 Sunburst Mid Century Modern Wall Clock With Crystals: Give your wall a little frosting with a glam crystal wall clock. 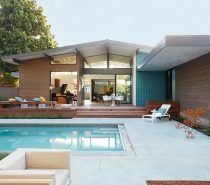 Think of it as Mid-Century Modern with a touch of feminine flair. 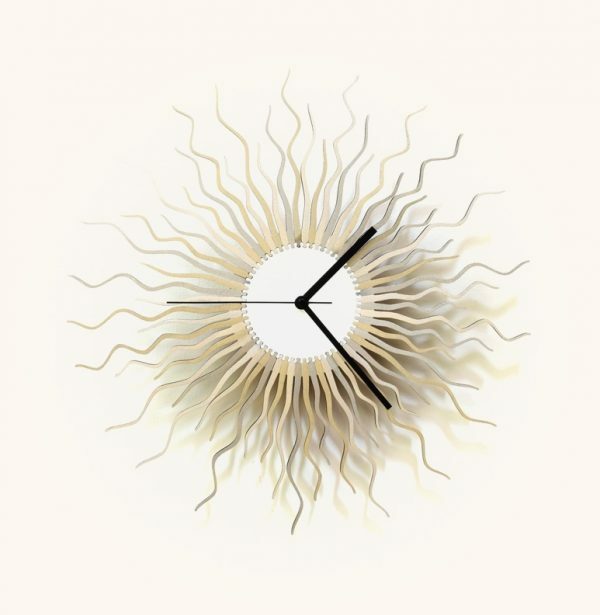 Medusa Wall Clock: A clock that would do Medusa proud with its snake-like, burst pattern. Made from laser cut wood and finished in white, along with 3 shades of silver. 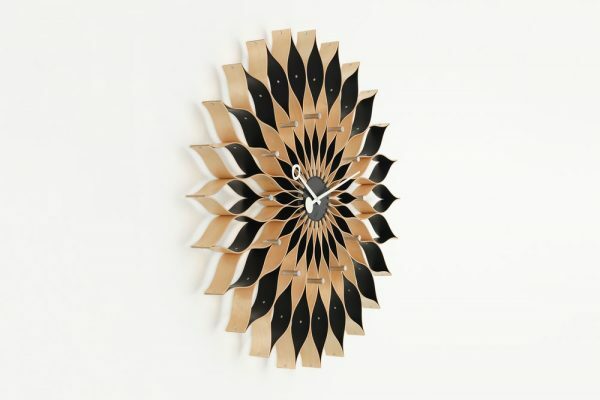 Sunflower Clock: This black and wood tone sunflower clock may be a design classic of the mid-20th Century, but it is still a stunner today. Made of ash wood and equipped with high-quality Quartz movements. A cheaper alternative is also available here. 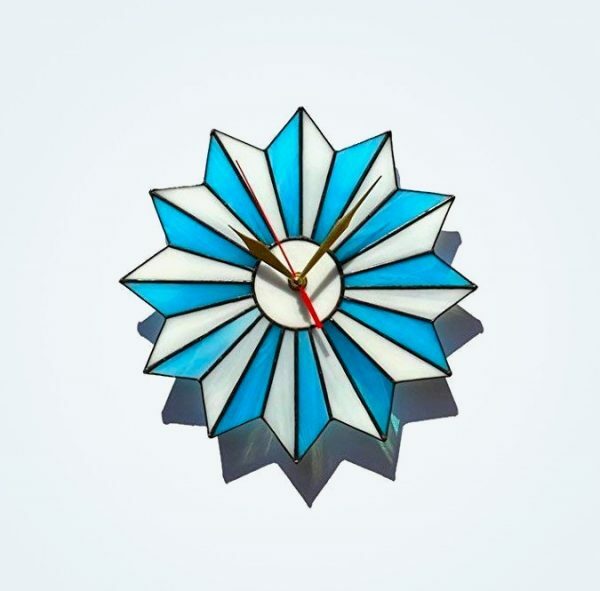 Mid Century Style Stained Glass Starburst Wall Clock: A little bit of light makes this stained glass beauty come to life. Due to the nature of this handcrafted clock by ZangerGlass, there’s no two alike, so you will always have a unique clock. Adjustable Minimalist Mid Century Modern Clock: A Mid-Century Modern Clock after the minimalist’s heart! This chunky timepiece can be used as either a wall or a desk clock and features an adjustable design. 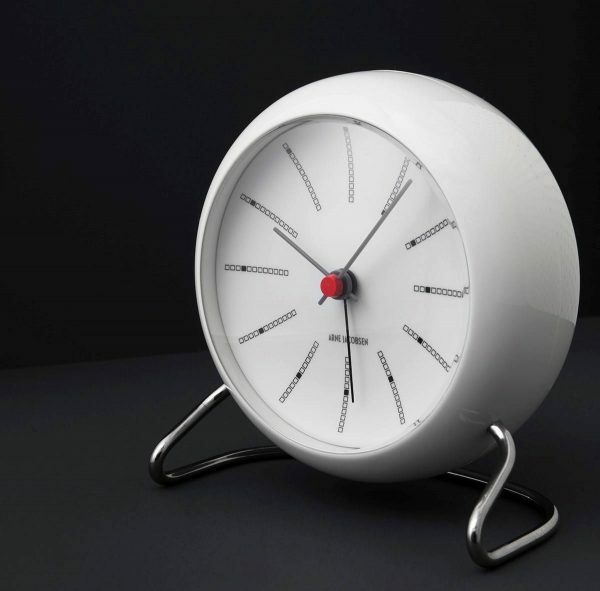 Vitra Eye Clock: You may of heard that “beauty is in the eye of the beholder”, but what about the eye of your clock? 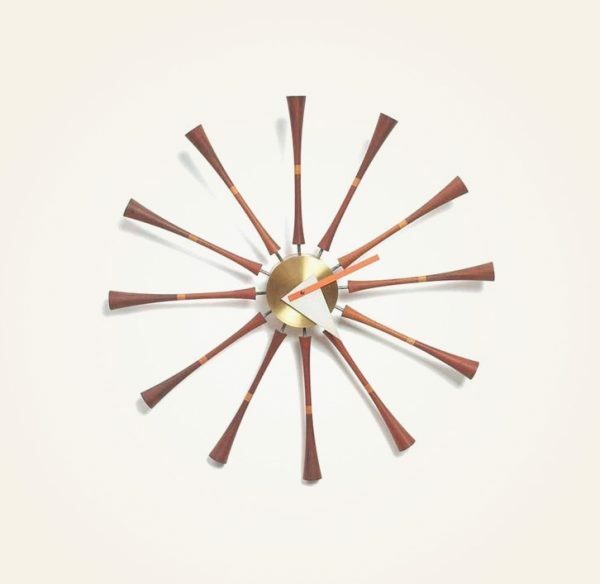 This unique wall clock is one of over 150 clocks that George Nelson’s office designed for Howard Miller. Pictured is the an original reproduction, but a cheaper replica is available here. 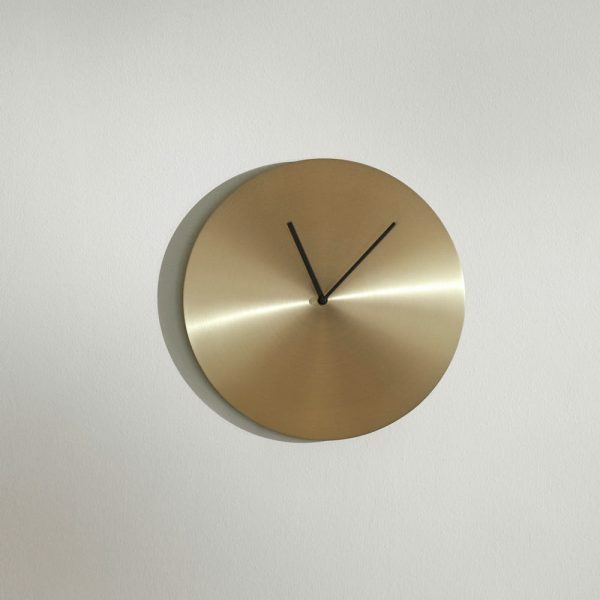 Menu Norm Metal Wall Clock: A sleek minimalist clock that is well-suited for an array of interiors. With the metallic sheen of its face and its simplistic design, it will look divine on any wall, but without stealing the spotlight! 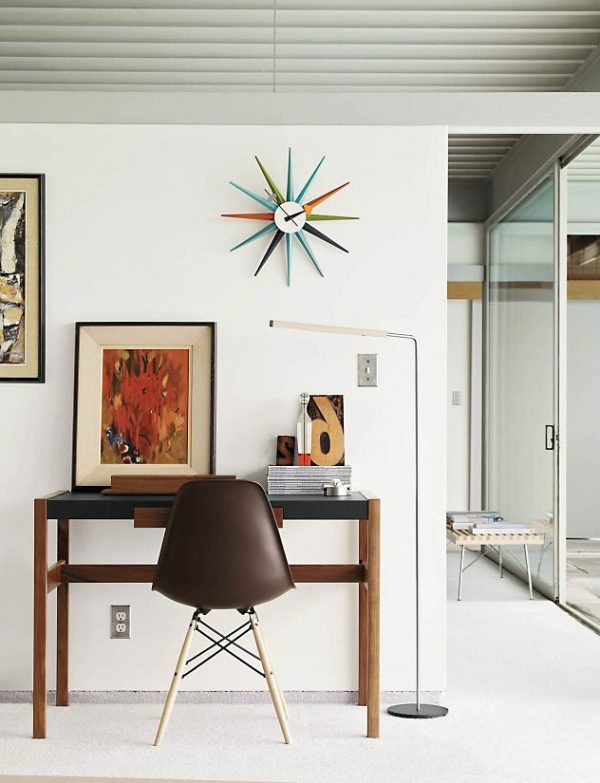 Oversized Mid Century Modern Wall Clock: Big, bold, and over 3 feet tall, this is the clock you need for that blank wall that needs a little extra pizzazz. 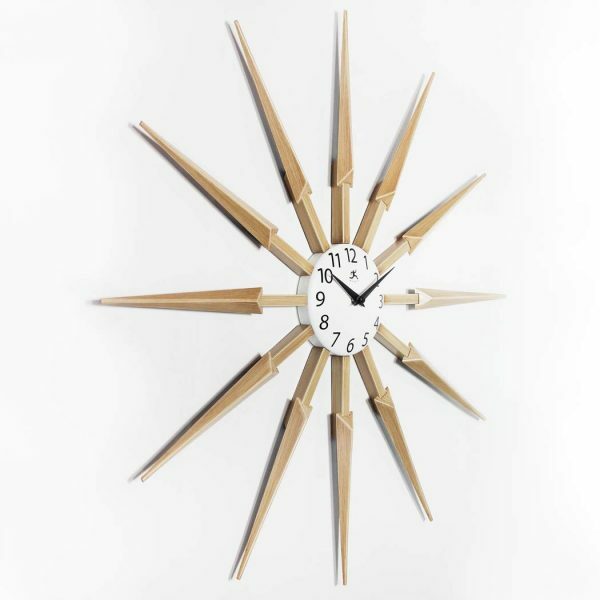 Reminiscent of a compass, this Mid-Century Modern clock would look great in a beach house or nautical themed home. 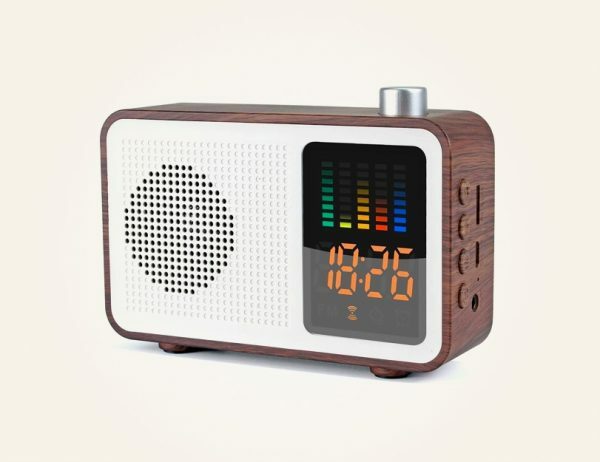 Mid Century Modern Style Retro FM Radio Clock: A highly affordable digital clock with modern capabilities that you won’t want to miss: Bluetooth speakers, incredible battery life, and a colorful beating spectrum that syncs up with any beat. Available in Maple Wood or Walnut Wood (shown). 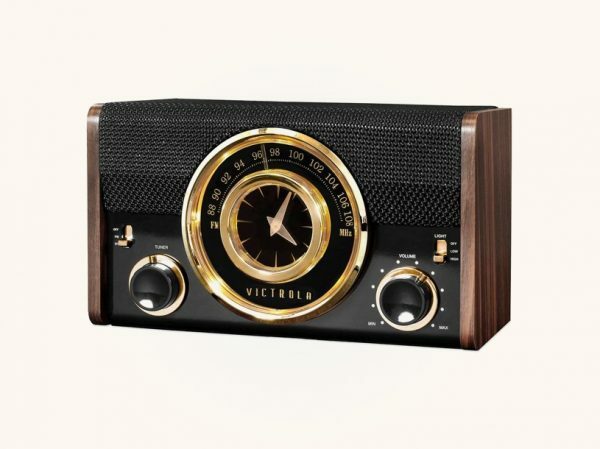 Mid Century Style Bluetooth Speaker/Radio/Clock With Golden Accents: A Retro clock radio that utilizes the dynamic contrast of black and gold. Complete with a clock face, radio, Bluetooth, and adjustable light. Walnut Mid Century Modern Desk Clock: Sleek and simple, this desk clock needs no fancy bells and whistles to be utterly fabulous. An exclusive World Market clock that is made in India. Nickel Finish Mid Century Desk Clock With Tripod Legs: This desk clock will infuse any surface with style and whimsy. A fun choice for any desk with its nickel finish and contrasting legs reminiscent of a 1950’s television set. Sunburst Style Desk Clock: A small timepiece with big style! 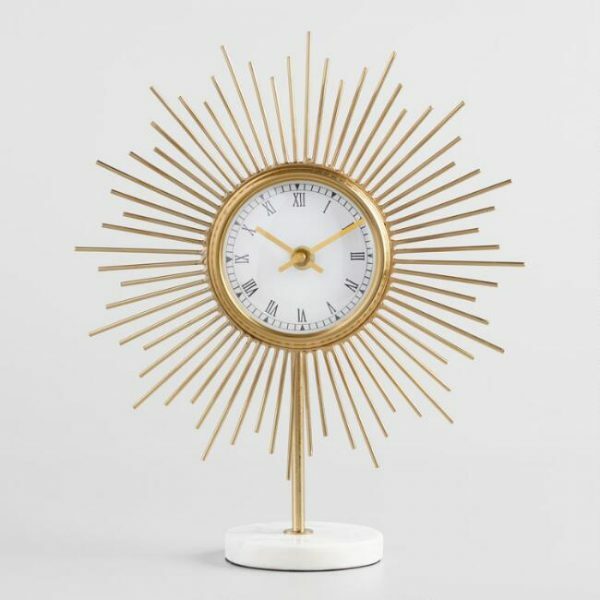 With its gold sunburst design and elegant, white marble base, this Mid-Century Modern desk clock is a great choice for a desk, mantel, or shelf. 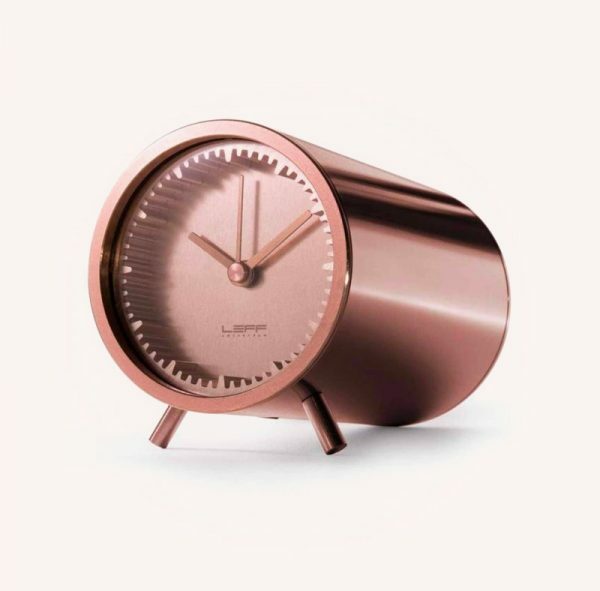 George Nelson Tripod Desk Clock: With its gold finish and small size, this compact clock radiates luxury and elegance. A retro design brought back to life using the original design document from the Nelson archive. 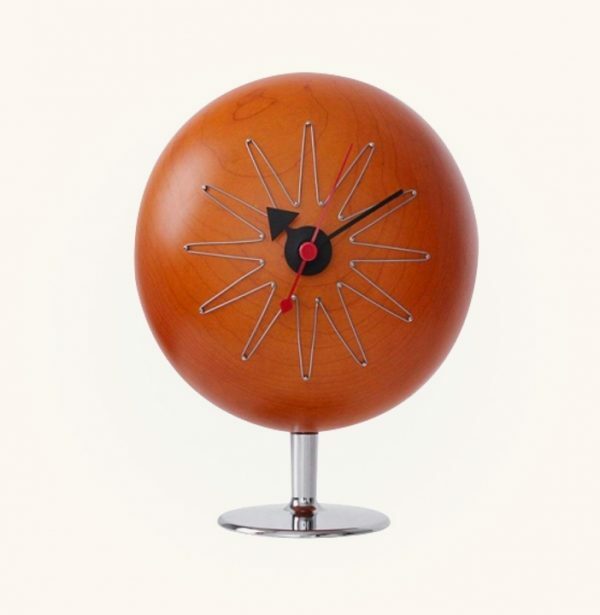 Mid Century Modern Pill Desk Clock: Just what the design doctor prescribed! 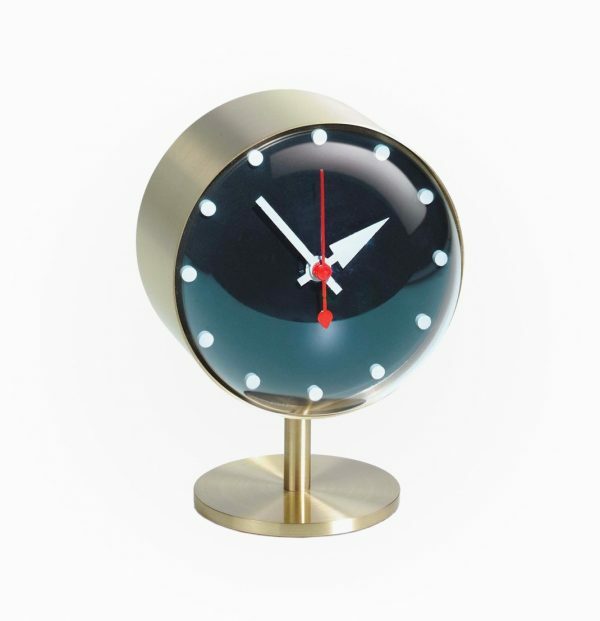 This pill desk clock features a round face elevated by a chrome pedestal. An unusual design that is both eye-catching and functional. 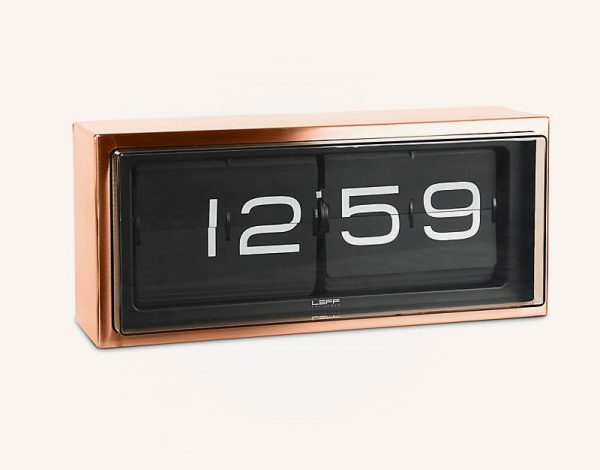 Copper Finish Mid Century Modern Style Clock: The silent movement of this copper desk clock makes it an ideal choice for those who like silence in the office or bedroom. Also available in Brass. 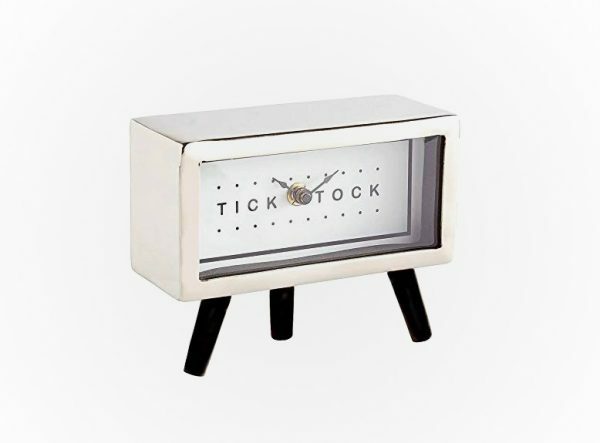 Mid Century Modern Style Flip Clock: A clock chock-full of vintage charm and practicality. This Mid-Century Modern clock features silent ticking and an absence of harsh, digital light. Also available in Stainless/White. Arne Jacobsen Bankers Table Clock: Earlier on our list we presented the wall clock version of this Arne Jacobsen classic, but we love this design so much, we couldn’t resist also including the table clock! 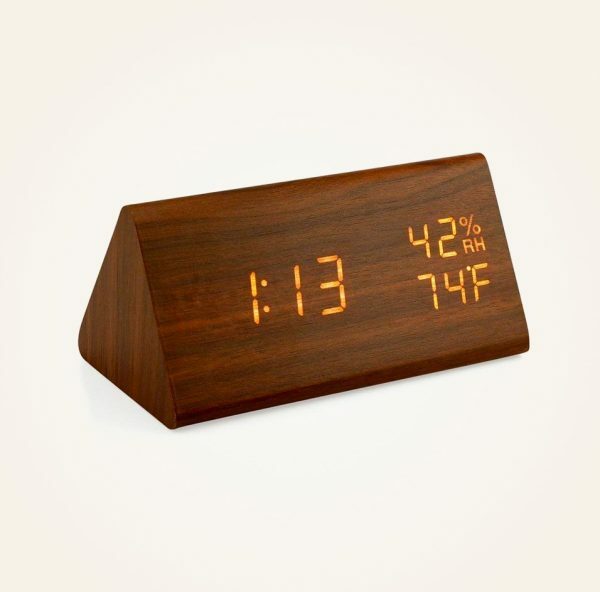 Mid Century Style Wooden Desk Alarm Clock: High style doesn’t always come at a steep price. This unique alarm clock will have everyone thinking you paid top dollar, but in actuality it comes at a price that is friendly to most budgets. Includes voice control, temperature, humidity, and adjustable brightness. Minimalist Round Mid Century Modern Wall Clock: A little slice of minimalist heaven for your wall. 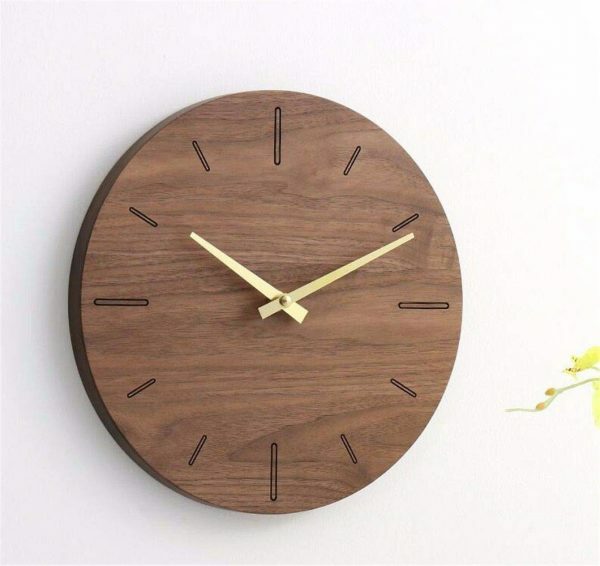 This wooden wall clock is a non-ticking timepiece that is both stylish and easy to read. Available in 2 sizes, with or without numbers. 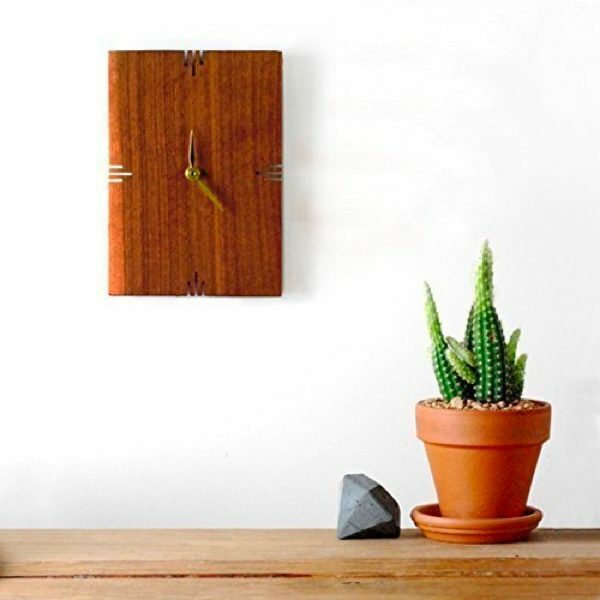 Small Wooden Mid Century Modern Wall Clock: Even small spaces need the extra panache that a Mid-Century Modern clock can bring! This hand carved clock fits the bill with its compact size, solid walnut build, and luster finish. A home run from the design team over at Son of a Sailor. Fornasetti Plates Inspired Wall Clocks: Let’s face it, sometimes your clock needs to be a complete showstopper. 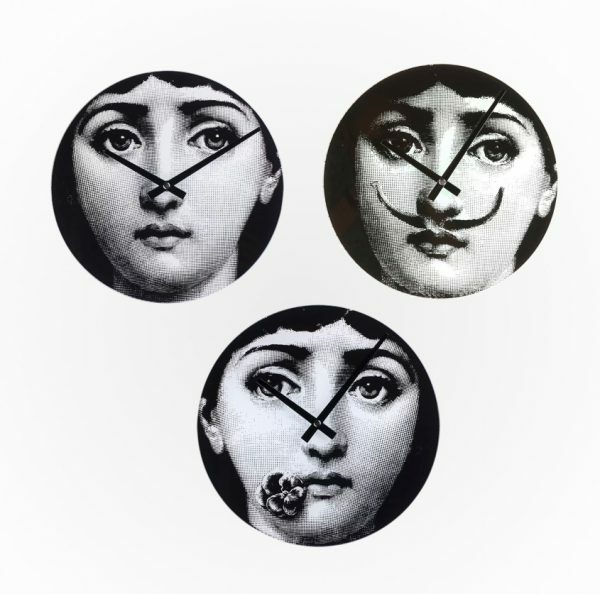 If that’s the case, then you need to consider a Fornasetti plate-inspired wall clock. Featuring the face of the operatic soprano, Lina Cavalieri, artist Pierro Fornasetti thoroughly captured the whimsy or this icon in his signature collection, Themes and Variations. These unusual and edgy faces are sure to add a dash of the unexpected to any space!